To Cite: Rashidi M, Seghatoleslam A, Namavari M, Amiri A, Fahmidehkar M A, et al. Selective Cytotoxicity and Apoptosis-Induction of Cyrtopodion scabrum Extract Against Digestive Cancer Cell Lines, Int J Cancer Manag. 2017 ; 10(5):e8633. doi: 10.5812/ijcm.8633. Background: Cancer is one of the major threatening factors of human health worldwide. Unfortunately, chemotherapy, the powerful arm of cancer therapy, is accompanied with many side effects, so alternative treatments with greater specificities and fewer side effects are highly required. Methods: Human cancer cell lines including SW-742, HCT116, HepG2, Hep2, MKN45 and LNcap were selected and the anti-cancer potential of Cyrtopodion scabrum extract (CsE) on their growth was studied. Vero cells were used to study the potential cytotoxicity on the normal cells. Cell cycle analysis and DNA fragmentation assay were also performed. Results: CsE was toxic (30% - 78%) to all the cell lines, with the highest cytotoxicity on SW742, MKN45 and HepG2, respectively. 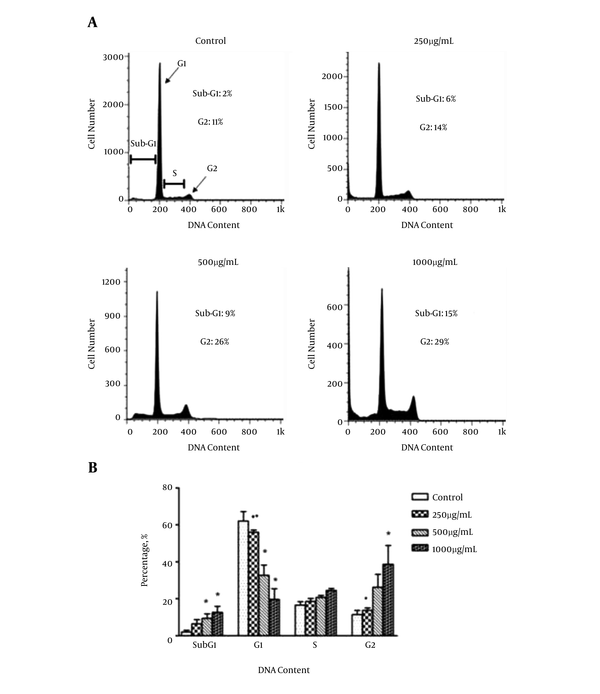 A high selectivity index (> 2) was observed for the extract on SW742 and MKN45 cell lines. DNA laddering pattern, as well as a significant increase in the number of the cells accumulated in sub-G1 and G2-phase of the cell cycle compared to the control untreated cells, was also observed. Conclusions: CsE suppressed the human cancer cells selectively and probably through apoptosis and G2 arrest mechanism. It could suggest a promising alternative/complementary treatment for cancer patients, especially those who suffer from digestive tract cancer. Cancer is one of the leading causes of death worldwide. It is predicted that the prevalence of cancer might proceed up to 45% in developing countries in 2025 (1). After lung and breast cancer, colorectal cancer is the third prevalent type of cancer in the world (2) which accounts for 9.7% of all cancer deaths (3, 4). The incidence of this type of cancer is the fifth and third among Iranian men and women, respectively (5, 6). Chemotherapy is one of the main strategies for cancer treatment, but most of the chemotherapeutic drugs are cytotoxic (7) and kill tumor and normal cells simultaneously, causing numerous adverse events such as anemia, infection and pain. In this regard, administration of less-cytotoxic drugs and natural alternative products have been the aim of many recent studies. Nowadays the use of traditional medicine (TM) for achieving useful drugs to treat variable diseases has become the focus of attention (8-11). Two most powerful branches of TM are herbal therapy (12-14) and zoo therapy; the latter uses different parts of the animals’ body and their products as drugs. Traditional Iranian medicine (TIM) can be traced for fourteen centuries with famous scientists such as Ibn Sina (Avicenna: 980 - 1037 CE) and Al-Razi (Rhazes: 865 - 925 CE) (15). Ibn Sina is well-known for his valuable and impressive efforts for the introduction of clinical trials (16) and preparation of a precise guideline for practical testing in detecting the effectiveness of natural medical substances (17). Al-Razi also explored the concept of hygiene (18) and was the first pioneer who has used two groups of studies (test and control group) in his research to evaluate his findings (18). According to traditional Chinese medicine (TCM), several studies have shown that the whole body of a kind of lizard, named Gecko Swinhonis Guenther, has been used to treat various diseases such as cancer for decades (19-22). Recently, we have reported the inhibitory effect of Cyrtopodion scabrum (so called rough-tailed home gecko) extract on the human breast and colorectal cancer cells (23). The rough-tailed geckonid lizards have 15 - 16 species distributed in southwestern, central and eastern parts of Iran (24, 25). In this research, we investigated the anti-proliferative and potential cytotoxic properties of rough-tailed home gecko extract on some different human cancer cells. In this study, we prepared Cyrtopodion scabrum extract (CsE) and evaluated its cytotoxicity on some human cancer cell lines (digestive and non-digestive). We further evaluated it for apoptosis induction on SW742 colon cancer cell line, as the most affected cell line by the extract. The selectivity of the extract was also verified using normal cell line, Vero. Cyrtopodion scabrum was provided by Razi research institute of vaccine and serum, Shiraz, Iran. The whole animals were ground to a fine powder and further extracted (water extraction and ethanol precipitation) to obtain Gecko Sulphated-Polysaccharide-Polypeptide (GSPP), which were then desalted, dialyzed and freeze dried for later use. The procedure was carried out exactly according to the protocol described previously (20, 23, 26). SW742 and HCT116 (colon cancer), HepG2 (liver cancer), Hep2 (head and neck cancer), LNcap (prostate cancer) and MKN45 (stomach cancer) cell lines were purchased from the national cell bank of pasteur institute of Iran. Vero (African green monkey’s kidney) cell line was a gift from Razi vaccine and serum research institute (Iran). Vero and MKN45 cells were cultured in DMEM and the rest of the cell lines were cultured in RPMI-1640 (shellmax, China). Cell culture media were supplemented with 10% fetal bovine serum (FBS), 100 U/mL of Penicillin, 100 mg/mL of Streptomycin and incubated at 37°C in 5% CO2 incubator. To evaluate the effect of CsE on the proliferation of the cell lines, MTT assay was performed. With the aim of having 80% - 90% confluency after 72 hours treatment, optimum numbers of the cell lines, according to their growth rate, were seeded in each well of 96 well-plates (6 wells for each) as follows: SW742: 3 × 103, HCT116: 5 × 103, HepG2: 1 × 104, Hep2: 6 × 103, LNcap: 1 × 104, MKN45: 1 × 104 and Vero: 2 × 103 cells. After 12 hours, the old media were replaced by 200 μL of fresh media containing different concentrations of the extract (100, 300, 500, 700 and 1000 μg/mL). The old media of the negative control wells were replaced by the fresh intact media. The positive control wells were supplemented with different concentrations (10, 20, 30, 40, 50 μg/mL) of 5-fluorouracil (5-FU) (Venus Remedies Limited, India). The plates were then incubated in a 5% CO2 incubator at 37°C for 72 hours. Tetrazolium bromide solution (Sigma, USA) was then added at 0.5 mg/mL final concentration to each well and incubated in the dark for 4 hours. The media were then aspirated from each well and 150 μL DMSO (Merck, Darmstadt, Germany) was added to solve formazan crystals. The plates were then shaken for 20 minutes on shaker and optical density of each well was measured at 570 nm on a multi-well ELISA plate (BMG Labtech, Germany) (27). All the experiments were carried out in triplicates. The SI values more than 2 were considered as high selectivity (28, 29). SW742 cells (4 × 106) were seeded into each 100 mm Petri dishes and incubated for 12 hours in a CO2 incubator. The old media were replaced by different concentrations of CsE (250, 500 and 1000 µg/mL, representative of IC50, 2 × IC50 and 4 × IC50, respectively), 5-FU (50 µg/mL) as positive control, and intact media as negative control in each corresponding Petri dish. The plates were then incubated in a 5% CO2 incubator at 37°C for 72 hours and prepared for DNA fragmentation assay or cell cycle analysis. The experimental cells were collected and the whole procedure for DNA fragmentation assay was performed according to the protocol described by Matassov et al. (30). At the end, the final DNA samples of the cells were mixed with 3 µL of KBC Power Load, as loading dye and intercalating nucleic acid stain, (Kawsar-Biotech company, Iran) and ran on 2% agarose gel at 70 volte for 30 minutes. After electrophoresis, DNA fragments were analyzed using red alpha imager gel dock (protein simple, Santa Clara, CA USA). 106 cells, from each one of the above mentioned samples, were harvested and washed with PBS. The procedure was carried out as described by Riccardi et al. (31). The fluorescence intensities were read by Becton Dickinson FACS Calibur flow cytometer (San Jose, CA, USA). The results were analyzed by FLOWJO software (version 7.6, USA) and the percentage of the cells in each phase was determined. All the experiments were carried out in three independent experiments and data were presented as Mean ± SEM. Statistical analyses were performed using SPSS 17 software (Chicago, USA). One-way ANOVA and LSD post hoc test were used to compare the groups. Graphs were plotted using graph pad prism 5 software (San Diego, CA, USA). Curve expert 1.3 was used for IC50 values calculation. P values ≥ 0.05 were considered as significant. Figure 1 represents the effect of CsE on the viability of all the cell lines applied in this study. As shown, the extract inhibited the cancer cells’ survival in a dose dependent manner. This amount varied between the minimum of about 30% - 40% for Hep2, LNcap and HCT116 and the maximum of about 53% - 78% for HepG2, MKN45 and SW742, respectively, at the highest applied concentration (1000 µg/mL). The normal cell line, Vero, was inhibited by only 20% at this concentration and by about 10% at the concentration of 250 - 500 µg/mL of the extract. IC50 and SI values were also calculated for gecko extract on all the cell lines and compared to those calculated for 5-FU. The results are presented in Table 1. As seen, SW742, MKN45 and HepG2 were the most affected cell lines by the extract, with IC50 of about 251, 380 and 860 µg/mL, respectively. IC50 values calculated for other cell lines along with the normal cell line, Vero, were more than1000 µg/mL, showing that the extract did not suppress these cell lines dramatically. The highest SI values calculated for gecko extract also belonged to the three above mentioned cell lines including SW742 (> 3.98), MKN45 (> 2.63) and HepG2 (> 1.2) compared to the other cell lines. The SI values calculated for 5-FU for all the cell lines were very low, ranging between < 0.012 and 0.18, dependent on the cell line, indicating the superiority of gecko extract on the cancer cell lines compared to 5-FU. aIC50 values are presented as mean ± SEM according to two independent assays, each done in triplicate. bSI refers to Selectivity Index.SI values > 2 was considered as high selectivity. cIC50 > 1000 μg/mL is considered as non- determined (ND). As the most affected cell line by CsE, according to the results obtained in the previous section, SW742 cell was selected, treated with CsE and analyzed by the following experiments. SW742 cells treated with CsE displayed characteristics of DNA laddering in a dose dependent manner. The picture from gel electrophoresis of the product of DNA fragmentation assay is presented in Figure 2. The control negative (untreated) cells represented an intensive band in the lane 2, showing the intact DNA content of these cells. DNA fragmentation pattern in lanes 3, 4 and 5 are clearly obvious for the cells treated with different concentrations, IC50, 2 × IC50 and 4 × IC50, of gecko extract, respectively. The same pattern was also observed in lane 6 for the control positive cells treated with 5-FU, as expected. Figure 2. DNA Fragmentation in SW742 Cell Line. Lane 1 Represents a DNA Marker of 100 bp. As Shown in Lane 2, the DNA Content of Untreated Negative Control Cells Is Intact, Showing One Intense Band. DNA Fragmentation Process Has Been Occurred for the Treated Cells in Response to Different Concentration (IC50, 2 × IC50 and 4×IC50) of Gecko Extract (Lanes 3, 4, 5, Respectively). The Pattern of DNA Laddering is Obvious for the Cells Treated with 5 FU, as Positive Control (Lane 6). The results of the analysis of apoptosis by propidium iodide staining are presented in Figure 3 (A and B). It reveals the effects of increasing concentration of CsE on SW742 cell cycle progression through sub-G1, G1, S and G2 phases. 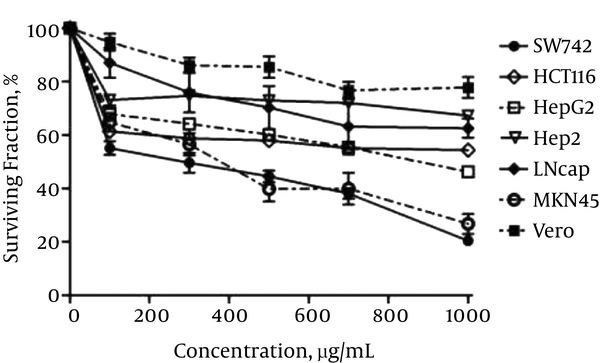 As shown, in comparison to the control untreated cells, gecko extract at the concentrations of 500 (2 × IC50) and 1000 (4 × IC50) µg/mL for 72 hours resulted in a significant increase in the cells accumulated in sub-G1 peak, indicating hypodiploid apoptotic cells, when compared to the control untreated cells. It was accompanied with a dramatic reduction of the number of the cells in G1 phase. The proportion of the cells in S-phase was not altered by the extract but a significant increase in G2 phase was also observed at 4 × IC50 of CsE, indicating cell cycle arrest in G2 phase. A, DNA Content Histogram; B, The Comparative Presentation (As Percentage) of the Cells Accumulated in sub-G1, G1, S and G2 Phase of Cell Cycle. DNA Content Assay Shows C. Scabrum Extract Causes a Significant Increase in sub-G1 Fraction (Indicative of Apoptosis) in 500 and 1000 µg/mL Concentration. A Dramatic Decrease in G1 and Significant Increase in G2 Peaks Are Also Observed Proposing G2 Arrest of the Treated Cells. The Graph Represents the Mean Values ± SEM of 3 Independent Experiments; *vs. control (P < 0.05); ■ vs. 1000 (P < 0.05); ● vs. 500 (P < 0.05). Despite the rapidly increasing information about the molecular and cellular processes involved in carcinogenesis, the incidence of this disease is still rising. Several drugs are used to treat and prevent the development of the tumor, but they are not always effective and usually are accompanied with unwanted side effects. Alternative treatments based on natural products (plant, and animal) with a greater specificity and fewer side effects might be a potential safe candidate for treatment of cancer. In this regard, several reports showed that a Chinese lizard, Swinhonis Guenther, has been used for many years to treat some diseases including cancer (19-22, 26, 32, 33). In this study, we investigated the potential anti-cancer properties of Cyrtopodion scabrum (so called home gecko) as one of the species of rough-tailed geckonid lizards distributed in southwestern, central and eastern parts of Iran (24, 25). For this purpose, some digestive (SW742, HCT116, HepG2, Hep2, MKN45) and one non-digestive (LNcap) cell lines were selected and exposed to different concentrations of C. scabrum extract (CsE). We applied Vero cell lines with the aim of studying the probable cytotoxicity of gecko extract to normal cells as well. In vitro cytotoxicity test was mainly performed to screen different cell lines according to the grade of their impression by the extract. A 72 hours-incubation of the cells with CsE prior to MTT assay and calculated IC50 values for all the cell lines revealed that the extract was significantly cytotoxic to the digestive cell lines, by different inhibition percentages, ranging between 30% - 78%, as SW742 (78%), MKN45 (68%), HepG2 (53%), HCT116 (40%), and Hep2 (30%). LNcap cells were also inhibited by about 33% when treated with the extract. These data are in agreement with the results from previous studies indicating the inhibitory effects of C. scabrum extract on MCF-7 (breast) and SW-742 (colon) cancer cells by 32.6% , 62% inhibition, respectively (23) and S. Guenther extract (19, 20, 22, 26, 33) on EC9706 (esophageal carcinoma) and HepG2 (hepatocarcinoma) cell lines by 49.6% and 92%, respectively. The low IC50 values for SW742 (251 ± 13) and MKN45 (380 ± 7) as well as the high SI values for the extract in these cells (> 3.98 for SW742 and > 2.63 for MKN45) suggest CsE as a promising therapeutic candidate in patients with digestive tract cancers particularly colorectal and stomach cancers. Knowing that the greater the SI value is, the more selective it is and SI values less than 2 indicate general toxicity (34), we concluded that compared to 5-FU, the common chemotherapy drug, with a very low SI values (< 0.18), gecko extract is a better candidate for growth suppression of all the examined cell lines with SI values > 1. Gecko extract was also evaluated for cancer apoptotic death mode. For these trials, SW742 cells, as the most suppressed cancer cells by the extract, were selected and underwent subsequent analyses. Apoptosis, the programmed cell death, occurs when the cells face vigorous stress that they could not compensate. Evaluation of apoptosis was performed by determining the DNA laddering as a consequence of DNA fragmentation, indicative of late stage apoptosis (35). Activation of endonuclease during apoptosis results in the cleavage of DNA into oligonucleosomal size fragments of 180 bp that appears as a ladder pattern on agarose gel after electrophoresis (36). Interestingly, SW742 cells treated with IC50, 2 × IC50 and 4 × IC50 of CsE showed characteristics of DNA laddering in a dose dependent manner. Apoptosis was further evaluated by PI staining as well. DNA flow cytometry analysis after 72 hours of treatment with the extract displayed a broad hypodiploid apoptotic cells (sub-G1) peak followed by a significant decrease in cell population in G1 phase. A significant increase in cell population in G2 phase was observed, simultaneously, in a dose-dependent manner, suggesting a G2-arrest in the cell cycle. Normally, when DNA damage occurs late in G2, it prevents entry to mitosis, so G2 checkpoint provides an opportunity for repair and stopping proliferation of the damaged cells. Since G2 checkpoint helps to maintain genomic stability, it is an important focus in understanding the molecular causes of cancer. Efforts to modulate cell-cycle arrest in G2-M are the subject of laboratory and clinical studies. Both approaches for enhancing or abrogating arrest have been used to improve cytotoxicity of the known agents. Although promising, these initial efforts have led to a number of questions that remain unanswered (37). Similar effects for sulfated polysaccharide (Gepsin) from S. Guenther extract in G2-arrest induction on Bel-7402 liver cell line (20) and apoptosis induction in HepG2 with an elevated bcl-2/bax ratio have been also reported by other scientists (33). On the contrary, two investigations showed that this extract did not induce apoptosis in SMMC-7721 (26) and Bel-7402 liver cell lines (20). It seems that various mechanisms of action in different cancerous cell lines may be the cause of this conflict. Several reports have mentioned that the compounds which induce apoptosis and G2 arrest in the colon cancer cells may expedite it through different signaling molecules, for example down-regulation of cyclin A in COLO 320 HRS cells (38), up-regulation of cyclin B and down-regulation of cyclin E, D, E2F1 and E2F2 level in HT29 cells (39), reduction in cdc22 and induction in p53 and p21 level in LoVo and PKO cells (40) and induction in p27 in SW480 cells (41). A parallel study from our laboratory (unpublished data) has shown that CsE could induce p53 protein up-regulation. The tumor suppressor protein (TP53) plays a key role in regulating the cell cycle and is one of the most important elements of our body’s anticancer defense (42). It serves as a principal mediator of growth arrest and apoptosis, regulating a large number of diverse downstream genes with regulatory function in multiple signaling processes which needs to be explored further. There is no doubt that reactivation of p53 function has a great potential as a novel therapeutic strategy in CRC (colorectal cancer) (43). In conclusion, the present in vitro study demonstrated the abilities of C. scabrum extract as a good therapeutic agent for cancer treatment as it not only has a highly potent activity at lower concentrations but also it exhibits a high degree of selectivity, especially in digestive cancer cells. Further investigations on the mechanism of the growth suppression and evaluating the efficacy of the extract in animal model are underway. This article was extracted from the PhD thesis written by Mojtaba Rashidi and is financially supported by Shiraz University of Medical Sciences, Grant No.93-7045.